dbclunie: Video : CEO of MakerBot Bre Pettis At The OHS! Video : CEO of MakerBot Bre Pettis At The OHS! 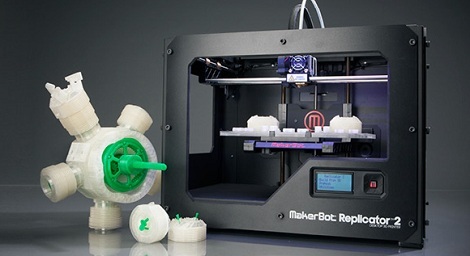 So the release of the newest 3d printer from MakerBot Industries, the MakerBot Replicator MK2, created a brouhaha across the maker community with both detractors. Ok, quite a few detractors such as Josef Prusa Creator Of Prusa Mendel 3d Printer and Zachary Smith co-founder of MakerBot Industries, for starters , but a few kind of supporters such as Adafruit Industries. There was/is even a revolt on thingaverse, the website where you can download "things" to print out on any 3d printer, which turns out was over the TOS. "Folks really want a black or white answer, but in my experience, it just doesn’t work that way when combining open source, hardware, and business. There is an open hardware definition, but it’s a far throw from a business model." So skip to the Open Hardware Summit, which Bre gave the keynote last year, and was scheduled to talk this year. It was much anticipated on what he would talk about, would he try and explain further the position of open vs closed hardware that the Makerbot Replicator2 has taken, or would he speak about something entirely off the wall and non makerbot related? Well here is the talk and I'll let you find out what Bre ends up discussing. Be sure to watch the other parts of the talk in case you're interested in the OSH community.